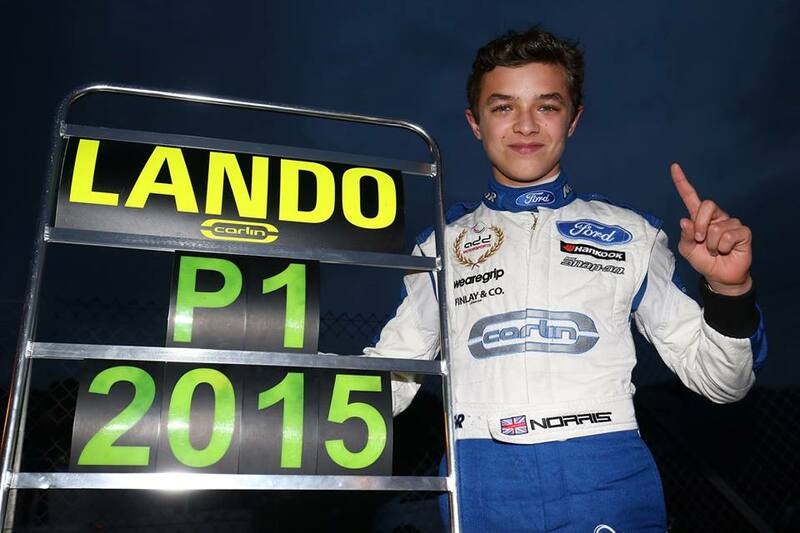 DRIVER NEWS 12 OCTOBER, 2015 – Super Somerset driver Lando Norris is crowned the 2015 MSA Formula Champion title – after another brilliant weekend’s racing. The 15-year-old Carlin racer notched up his eighth win of the season to become the FIA Formula 4 Champion of Great Britain with a race to spare at Brands Hatch. Adding to the huge tally of titles to his name, he reaffirmed his status as one of the world’s most exciting young drivers. And the ADD Motorsports-supported driver was delighted to have finished the job a race early rather than rely on a nail-biting final outing. He said: “It feels really good to take the title, it’s a great Championship to win. Carlin has done a brilliant job in getting me to this point, along with my engineer Stefan de Groot and performance team ADD Motorsports. Lando’s latest title win is certainly no fluke, coming on the back of several brilliant trophy-laden seasons. He signed off from his glittering karting career last year as the youngest ever World Championship winner when he took the CIK FIA KF crown, also finishing third in the Ginetta Junior Championship and taking the Rookie Cup. He also took the Formula Kart Stars series title in 2012 and won the WSK Euro Series, CIK FIA European Championship and CIK FIA Supercup a year later. Lando went into the final weekend of the MSA Formula Championship 13 points ahead of closest rival Ricky Collard – as he looked to add another trophy to his cabinet. He made sure he gave himself the best possible chance of extending this lead by getting the fastest lap in qualifying, with his second fastest lap good enough to see him get pole for the final race as well. Despite not getting off to the best of starts, the racer soon put some distance between himself and Carlin team-mate Colton Herta. By the end of the sixth lap he had a 1.7 second advantage, although Herta made Lando work hard for the victory at the end. But it meant the teen needed to finish the second race no more than one place behind Collard to clinch the title early. He started the partial reverse grid in eighth, but soon found himself ninth and a few drivers away from where he needed to be. But half-way through the race, he saw an opportunity to overtake Dan Baybutt. It was a fast corner and a risky move, but he got in front and then spent the remainder of the race closing in on Collard ahead. At the finish he found out his seventh place was enough to win the title – although he managed another second-place podium on Sunday in the third race for good measure. As well as taking the title, Lando also wins an F3 test with a European team and 10 FIA F1 Superlicence points. He now plans on having a well-deserved break before hopefully moving on to Formula Renault next season on his quest to one-day move into F1.